You either love or despise fruitcake, but it's almost always unavoidable around the holiday season. While recipes may vary slightly, dried fruits, roasted nuts, juice, butter, sugar and flour are universal ingredients in most any fruitcake recipe. Since fruitcake is full of calorie-rich ingredients, even a small slice is relatively high in calories. 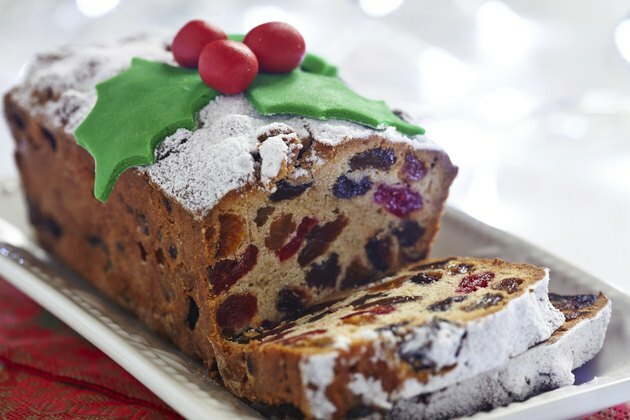 A small 1-ounce square of fruitcake contains more than 90 calories. Because some of the key ingredients in fruitcake are sweetened dried fruits and sugar, most of the calories are from carbohydrates. Nearly 66 of the calories, or 72 percent, come from the 16.4 grams of carbohydrates. Fruitcake provides less than a gram of protein, giving you a little more than 3 calories from protein, or about 4 percent of the total calories. The 2.6 grams of fat in a 1-ounce portion of fruitcake account for more than 23 calories, or about one-fourth of the total calories.